Here are my swap cards I made for the INKlings training day last Sunday. The swaps I received were all gorgeous. Well done girls! This is another sneak peak at some brand new products which will be available from the 1st April (no, it is no April fools). 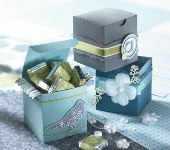 All 3 colours will be available in the Autumn/Winter Mini as well as the polka dot ribbon and the Top Note die. 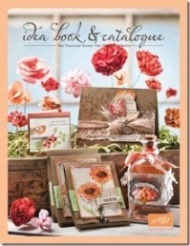 The stamp set (Fifth Avenue Floral) is in the current Idea Book & Catalogue. Not everyone was able to make swaps so I still have a few left over which I have decided to take to Convention (in May) this year.